January is a busy time of year for companies looking to amplify their regular payouts. I’ve already shown you a mess of master limited partnerships (MLPs) that should hike their distributions next month. But for those of you who don’t subscribe to those tax headaches, I have a list of traditional companies and real estate investment trusts (REITs) that should up the ante, if history is any indication. I encourage investors to seek out high yields and high rates of dividend growth – study after study shows the benefits of both. This isn’t just a localized market trait, either. Studies of global equities show exactly what we see here at home: That yield and growth truly matter over the long haul. 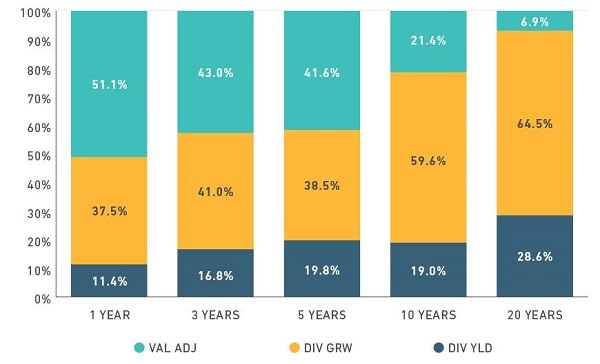 As you can see, dividend growth always matters the most. And that’s especially the case the further time goes on. That’s why I frequently publish these updates of both widely held stocks and lower-key potential opportunities – think of them as a regular check-up to see whether these dividend stocks are doing what they’re supposed to be doing. Today, I’m looking at 10 such stocks that should be raising their payouts come January (which boast yields from 1.6% all the way up to 9.3%). Bank of the Ozarks (OZRK) – a $6 billion-plus regional banking stock headquartered in Arkansas, serving the southeast, Texas, California and New York – isn’t exactly the biggest name in banking. But from a dividend standpoint, it has to be one of the most exciting. That’s because OZRK, in addition to running up 190% over the past five years, has been upping its quarterly dividend payment every three months since 2010. 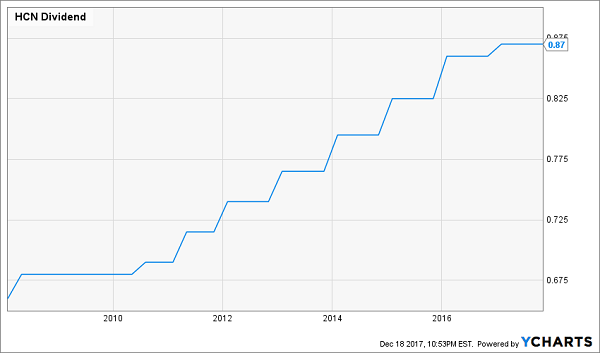 It’s not huge expansion, at just a half-cent per share for the past couple of years, but the steady increase has amounted to roughly 70% dividend growth since the beginning of 2014. And if the past is any indication, it should announce its intentions to sweeten the pot once more sometime during the first week of January. A roller-coaster past few years for snowmobile, ATV and electric vehicle maker Polaris Industries (PII) is back to climbing the hill. Share have flown more than 50% higher in 2017 to more than double the exuberant S&P 500. You can thank a string of earnings beats this year, including a nearly 20% upside surprise on the bottom line during its third quarter, fueled by a 25% spike in sales. That has helped overcome a spate of recalls for products such as its Scrambler XP 1000 ATVs and Slingshot three-wheeled motorcycles. Polaris should continue to curry favor with a dividend increase announcement sometime in the final week of January, which would apply to its distribution to be paid out in March. 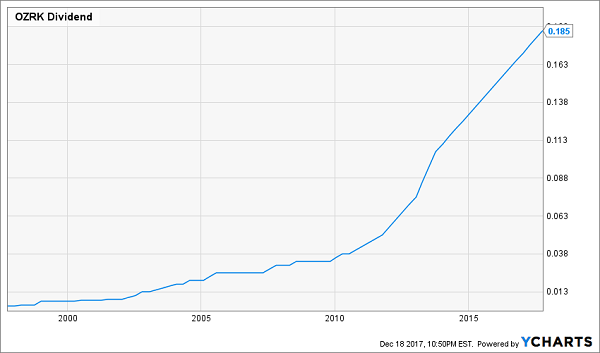 BlackRock (BLK), the asset manager behind the ubiquitous line of iShares exchange-traded funds, is having itself a blockbuster year, too, up 34% with very little time left in 2017. The market’s frenetic action this year has been a boon for BlackRock, which saw its total assets under management grow 17% year-over-year in Q3 to nearly $6 trillion. That includes $1.64 billion in its iShares ETFs, thanks to $52.3 billion in net inflows during the quarter. Up next? A likely dividend increase announcement sometime in the middle of January, piling on roughly 30% payout growth since 2014. American industrial gases giant Praxair (PX) is on a collision course with a very special dividend increase in the final week of January. That’s because if Praxair does up the ante, it will mark the company’s 25th consecutive hike to the annual payout, making it eligible for inclusion in the Dividend Aristocrats. Praxair is in the final stages of a $73 billion merger with German industrial gases leader Linde that should create the world’s largest such company. All told, Praxair expects to achieve $1.2 billion in cost savings over the next three years as a result of its corporate marriage. While 2017 has been a rip-roaring year for most parts of the market, the utilities sector has been found wanting. The Utilities SPDR (XLU) is up 12.3% year-to-date – a fine number in most any other year, but well shy of the S&P 500’s 19% performance. Dominion Energy (D) has contributed more than its fair share of lag, coming up lame with a 9% advance in 2017. That’s because while the company’s top line is churning along for a 10% growth pace this year, earnings are coming in behind last year – though profits are expected to rebound by about 13% in 2018. At least Dominion has been no slouch on the dividend front. The utility stock has grown its quarterly distribution 34% over the past five years, and should once again boost its payout sometime in the final week of January. Las Vegas Sands (LVS) will have something to prove to income investors in late January, when the company should announce an improvement to its quarterly payout. That’s because the casino and resort operator’s dividend growth pace slowed to a near-halt at the start of 2017, when it raised its payout a mere cent to 73 cents per share after more than doubling its dividend between 2013 and 2016. Granted, that came amid a big slowdown in 2016 that saw revenues and net income take a significant step back; profits were off more than 40% from 2014 levels. However, progress in Macau and Singapore has fueled a better 2017 that should see profits rebound by about 23% when all is said and done. That should mean a somewhat more generous lift in its payout a few weeks after New Year’s. Another disappointing market sector in 2017 has been real estate, with the Vanguard REIT ETF (VNQ) flashing a weak 3% gain this year. That has included a fractional uptick in Realty Income (O) shares this year without factoring in its substantial dividend. Retail-focused real estate has taken a pounding this year amid thousands of store closings – fallout from Amazon’s (AMZN) relentless attack on brick-and-mortar consumption. The pain has mostly been relegated to mall operators, but Realty Income has taken its lumps – despite its positioning in single-tenant retail real estate, and despite a couple of encouraging earnings reports. 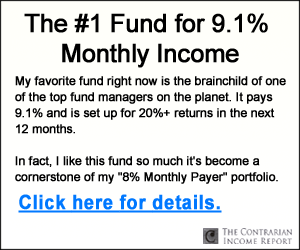 Nonetheless, “The Monthly Dividend Company” should be good for its 82nd consecutive dividend increase come January. While the company is inconsistent about the timing of some of its hikes, it’s typically good about ringing in the new year with a mid-month payout improvement. Welltower (HCN) is a diversified healthcare REIT that invest in senior housing, assisted living, post-acute care facilities, hospitals and other properties, though senior living has been carrying the flag of late. In the third quarter, senior housing operating same-store net operating income grew by just more than 4% year-over-year, leading the company to upgrade its full-year guidance to 2.5%-3% growth. That hasn’t meant much for HCN shares, which have advanced by just 2% this year as an early run has fizzled out over the past few months. Still, given that Welltower is paying a dividend well within its means – at about 80% of its FFO over the past few quarters – another dividend hike seems likely for 2018. Expect the authorization to come in the final week of January. EPR Properties (EPR) is one of the best examples of REITs capitalizing on the “experience economy,” in which experiences are trumping “stuff” in getting the attention of consumers and their hard-earned dollars. EPR is a unique REIT that invests in properties such as movie theaters, Topgolf entertainment complexes, ski areas and even early childhood education centers. Still, the company is suffering weakness this year amid mostly flat FFO. Shares are off about 6% this year, leveled out to roughly breakeven once dividends are factored in. The company forecasts significant improvement next year, however. 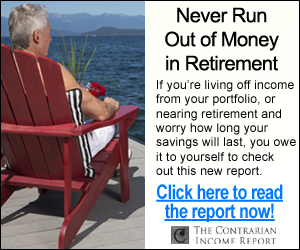 More short-term, investors can expect an increase to the monthly payout to be announced in mid-January. That said: There’s no reason to panic. The company clearly isn’t too concerned about the long-term impact of its Orianna troubles – it provided yet another quarterly improvement to its payout in the same quarter it recorded the writedown. 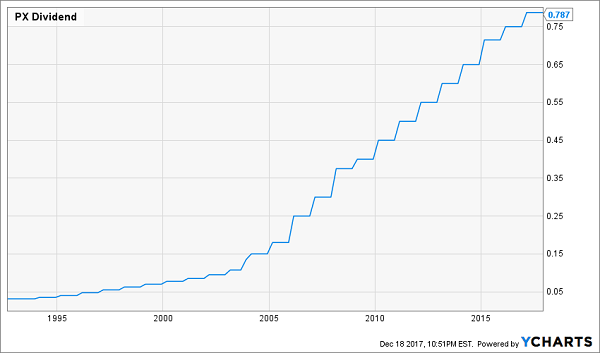 Optimists could see this as an opportunity to jump into a REIT that should benefit from the mega-trend of aging Baby Boomers at a high yield of more than 9% – a figure that should get a little higher early next year. 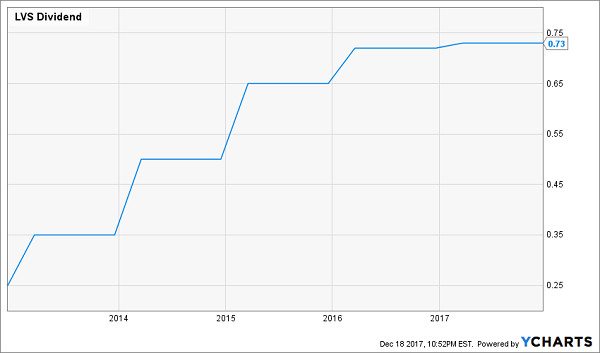 Look for a dividend hike sometime in the middle of January.